$2,399 Dental Implant, Abutment & Crown! Guaranteed Lowest Price in South Bay! Whether you’ve lost one, several or all of your teeth due to tooth decay, severe trauma or old age, dental implants can help you regain the natural function of real teeth. Unlike bridges or dentures, dental implants look and feel completely natural. The world will transform as you are able to enjoy all your favorite foods and activities without worrying about how your teeth look. If you would like to learn more about dental implants, schedule a consultation with Dr. Mileham. He will happily answer any questions you might have and also provide an expert evaluation of your teeth, gums and jaw bones to determine if you might be a good candidate for dental implants in Rancho Palos Verdes. Dental implants are revolutionary in restorative dental care. 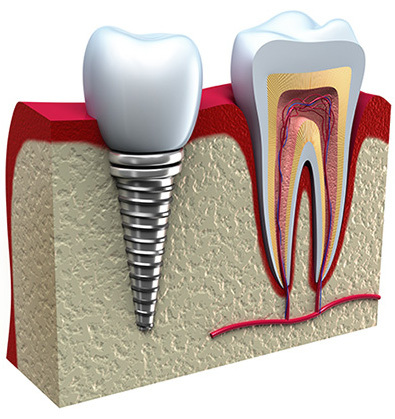 An implant consists of a titanium peg that is surgically implanted into the jaw and then topped with a porcelain crown. The bone in your jaw literally bonds with the titanium peg through a process called osseointegration, making the implant extremely stable while strengthening your jawbone at the same time. The finishing crown allows the completed implant to look and feel completely natural. If you have several missing teeth, we’ll replace them all with multi-tooth implants which provide for several crowns to be attached to a single titanium peg, providing replacements for all your teeth with minimally invasive procedures. Dentures used to be the only option for replacing a whole set of upper or lower teeth. Now, however, you can replace all of your teeth with implants and avoid many of the troublesome shortcomings of dentures. For example, you can eat your favorite foods without worrying about your dentures slipping. Dental Implants look and feel just like your natural teeth, so you can feel confident that they won’t embarrass you while you are eating or speaking. Plus, dental implants encourage bone growth in your jaw, which will help keep you from developing the gaunt, hollow-cheeked look that affects people with missing teeth. If you have just a few missing teeth, you may be considering a dental bridge as a way to replace them. Bridges are very common and relatively inexpensive but they are nowhere near as comfortable or hygienic as dental implants in Rancho Palos Verdes. Your dental bridge can trap food particles between the teeth on either side of them as well as between the top of the bridge and your gums, which causes tooth decay and gum disease. Over time, bridges can actually result in degradation and loss of neighboring teeth as well. Dental implants, however, are as easy to care for as your natural teeth and do not put adjacent teeth at any increased risk for tooth decay or gum disease. While Dr. Mileham does not perform implant surgery himself, he is nonetheless highly knowledgeable about this procedure. He can perform a skilled assessment of your teeth and gums and provide an expert recommendation as to your fitness for implant surgery. If you choose to pursue implants, you can trust Dr. Mileham to refer you to an excellent oral surgeon for any bone grafts you may require, as well as for the actual implant surgery itself. Following surgery you may return to Dr. Mileham to get your custom-made crowns which will finish off your implants. We encourage you to care for your dental implants properly so you’ll never have to worry about missing teeth again.